Facebook moves fast: one day after the news broke the social networking site said it was introducing a share button on its mobile site, the company revealed the feature is now available on its iOS and Android apps as well. "Today, Facebook announced that you can now use the Share button on iOS, Android and the Facebook mobile website to share news feed stories," the company told TechRadar in an email. "This gives people a fast way to share stories with friends from their mobile devices, just as they can from their computers." The share button works through the Facebook for Android app, Facebook for iPhone and iPad app and Facebook mobile website. Facebook also posted the announcement in its Newsroom, explaining how the feature works (not that most Facebookers aren't familiar with sharing). 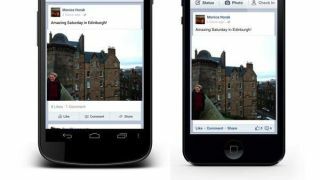 "When you click share on a news feed story in your Facebook app or on m-site, you can re-post the story on your own Timeline so your friends can see it," the announcement outlined. Something like this has been missing from Facebook's mobile presence for an oddly long time, so it's not too surprising the social network wanted to push this out as soon as possible.